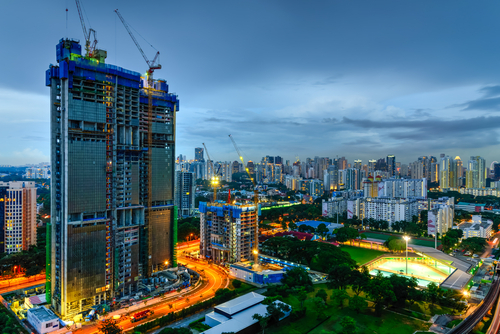 Singapore’s construction industry is expected to reach a value of US$27.1 billion in 2022, measured at constant 2010 US dollar exchange rates, according to Timetric’s Construction Intelligence Center (CIC). According to the report, Singapore’s construction industry suffered a sharp downturn in 2017, contracting by 7.9% in real terms over the year. The sector is expected to contract further in real terms, dropping 2.6% in 2018, before regaining growth momentum. Over the remaining part of the forecast period to 2022, however, the industry is expected to recover on the back of the government’s focus on the manufacturing industry and energy and utilities infrastructure. The industry is expected to be supported by improvements in business confidence over the forecast period, which will drive investment in infrastructure, commercial, residential projects and energy infrastructure. The focus on the development of renewable energy infrastructure is expected to drive industry growth. The government aims to generate 25.0% of the country’s total electricity consumption from renewable sources by 2025, compared with 12.6% in 2016. Accordingly, the government plans to invest SGD4.2 billion (US$3.2 billion) annually in the development of renewable energy infrastructure until 2020. The industry’s output value in real terms is expected to post a compound annual growth rate (CAGR) of 1.8% over the forecast period, compared to 0.5% during the review period (2013–2017). Residential construction was the largest market in Singapore’s construction industry during the review period, accounting for 28.6% of the industry’s total value in 2017. The market will retain its spot as the largest segment, but its market share is expected to decrease, accounting for 26.4% of the industry’s total value in 2022. The market is expected to register marginal growth over the forecast period, due to an increase in youth unemployment, an excess supply of private houses, a weak rental market and declining residential building permits. According to the Singapore Department of Statistics (DOS), the total value of residential construction permits issued declined by 19.4% in the first ten months of 2017, compared to the same period of 2016. Despite these, the government investment in affordable housing and population growth is expected to support market output over the forecast period. Accounting for 18.9% of the industry’s total value in 2017, industrial construction was the second-largest market in the industry during the review period. It is expected to account for 18.4% of the industry’s total value in 2022. The market output is expected to be supported by improvements in industrial and manufacturing activities over the forecast period, as well as subsequent investments in industrial infrastructure projects. This information is taken from the Timetric report: ‘Construction in Singapore- Key Trends and Opportunities to 2022’.